Caesar states that the Belgae, in particular the western branch known as Bellovaci, were of a particularly fearsome and unsympathetic nature in regard to the Romans. Indeed, their resistance played an important part in the final stages of his conquest of northern Gaul, when they formed an alliance with both the British and Armorican tribes, whose cross-channel neighbours were again ‘Belgae’, according to Ptolemy. Influential 20thC Irish scholar T.F. O’Rahilly even suggested that the Fir Bolg mentioned in the Lebor Gabála Érenn might be a branch of this widely-spread Iron Age ‘tribal group’ supplanted by Goidelic peoples from Spain in the 1stC BCE. It appears that the ‘Belgae’ were an influential bunch! In assessing the origins of tribes calling themselves ‘Belgae’, however, there is an important cultural movement among Iron Age Europeans that needs to be examined. This hinges on the events in the immediate aftermath of the death of Alexander The Great, perhaps also triggered by displacements caused by tribal movements from northern Europe. The culmination of this was the (infamous if you were Greek) events of 279BCE, which saw an invasion by a federation of massed Gaulish war-bands through the Balkans and the homelands of the Macedonian-Greek Empire of Alexander, penetrating right down into the Greek and Anatolian heartlands. This movement appears to have had a fundamental impact upon the warrior-culture of western Europe’s Celtic elites who absorbed the iconography of deified Alexander as Apollo, Mars/Ares and Ammon/Zeus/Jupiter and spread it back into NW Europe, famously represented in their magnificent coinage. The leaders and heroes of this famous invasion included the theophorically named Bolgios, who – as far as we know – survived the campaign and would have had sufficient prestige to then rule as a tribal dynast. The Gaulish tribe known as the Volcae-Tectosages were one of several whose creation appears to have resulted from this pan-Gallic enterprise, and who returned to the Gaulish homelands in the west, so it is possible that the Belgae might have been another cultural group or part of a Pan-Gallic movement who participated in this great warrior event. The names Volcae and Belgae/Bolgae in fact appear to be synonyms or variants of the same tribal designation, incorporating the name of the Pan-European god Belenos or Volos/Veles/Velnias who appears to have shared the same solar-martial aspects as the deified (at least by the Celts) Macedonian Warrior-King who conquered most of the known world… The Romans and Greeks would hereafter comment upon a fanatical, boastful and decapitation-obsessed faction when talking about Celtic barbarians – something akin to the modern Sunni Muslim ISIS/ISIL and Al-Qaeda movements. From Galatia to Galway: The NW thrust of ‘Belgic’ culture after 279. “… And there was formerly a time when the Gauls excelled the Germans in prowess, and waged war on them offensively, and, on account of the great number of their people and the insufficiency of their land, sent colonies over the Rhine. Accordingly, the Volcae Tectosages, seized on those parts of Germany which are the most fruitful around the Hercynian forest, (which, I perceive, was known by report to Eratosthenes and some other Greeks, and which they call Orcynia), and settled there. Which nation to this time retains its position in those settlements, and has a very high character for justice and military merit; now also they continue in the same scarcity, indigence, hardihood, as the Germans, and use the same food and dress.. ” Comentarii de Bellum Gallicum, Book 6. 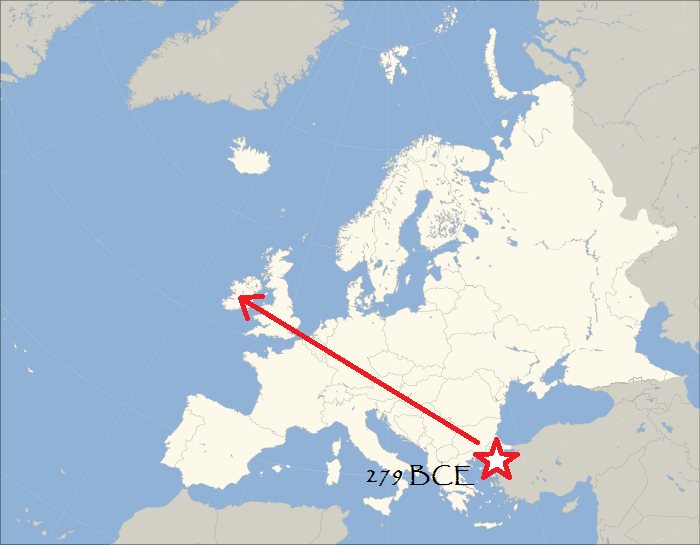 In short, my theory is this: The ‘Belgae’ were a manifestation of a cultural-religious movement that was an expression of the Celtic ‘war-band’ culture which sought the glory of Alexander and Delphic Apollo (who they identified with their main god, Belenos) and invaded and settled in Greece and Anatolia in the 3rdC BCE. This internationalist and warrior-centric culture transcended local ethnicity and introduced a fundamental ideological change among the Celtic/Germanic peoples of NW Europe which subsequently influenced their religious, military and philosophical outlook and had great influence upon their mercantile and numismatic culture. ‘Bel’, ‘Vel’ or ‘Belenos’ was the god most venerated in this culture who gave his name to this cultural movement which spread from Greece and the Balkans, up through the La Tene heartlands, up the Rhine and into Britain and Ireland over the next 4 centuries…. Fantastic post! Thank you for sharing all this knowledge on the Belgae.